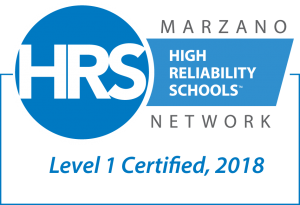 Bloomington, Ind., [March 29, 2018] Norwalk Schools is pleased to announce the achievement of Level 1 certification in Marzano High Reliability Schools™ for all five of our school buildings. Level 1 certification means Norwalk Schools have created a “Safe and Collaborative Culture,” which is the foundation for every level that follows. Without such a culture, student achievement will be compromised. Day-to-day school operations are addressed and evaluated in Level 1. The high reliability school (HRS) program was created by Marzano Research to help transform schools into organizations that take proactive steps to ensure student success. Using a research-based five-level hierarchy, along with leading and lagging indicators, educators learn to assess, monitor, and confirm the effectiveness of their schools. This framework, based on 50 years of educational research, defines five progressive levels of performance that a school must master to become an HRS—where all students learn the content and skills they need for success in college, careers, and beyond. “As you move through the levels, it represents a complete transformation in how schools are run,” says CEO Robert J. Marzano. Schools must collect data and validate their performance to climb each level of the hierarchy. Certification is determined by Marzano Research analysts in cooperation with school data teams. Using the HRS framework and indicators, schools can drive sustained, positive, and significant impacts on student achievement by synthesizing multiple complex initiatives into one harmonious system. Marzano Research combines Dr. Robert J. Marzano’s 50 years of educational research with continuous action research in all major areas of schooling. An all-inclusive professional learning center, the company provides K–12 educators with solutions for instruction, reflective teaching, curriculum development, leadership, student engagement, and competency-based education. Marzano Research’s services and products include customizable on-site professional development, educator events, books, videos, and online courses using research-based instructional strategies designed to effect profound improvement in student achievement.